Marta’s wine list punches well above its weight for an informal restaurant. Wine Director Katie Morton has put together a fun list full of artisan wines that will thrill even the most demanding palates. Few things are better than pizza and Champagne. The selection ranges from hard to find grower Champagnes, such as those of Olivier Collin, Cédric Bouchard and Anselme Selosse, to tried and true classics including Krug and Dom Pérignon. It would be nice to see a bit more breadth in the total number of estates represented given the relatively modest size of the Champagne portion of the list, but that is a pretty small critique. Bottles from Ciro Picariello, Arianna Occhipinti, Edi Kante, Cappellano, Burlotto and Montevertine are equally tempting. 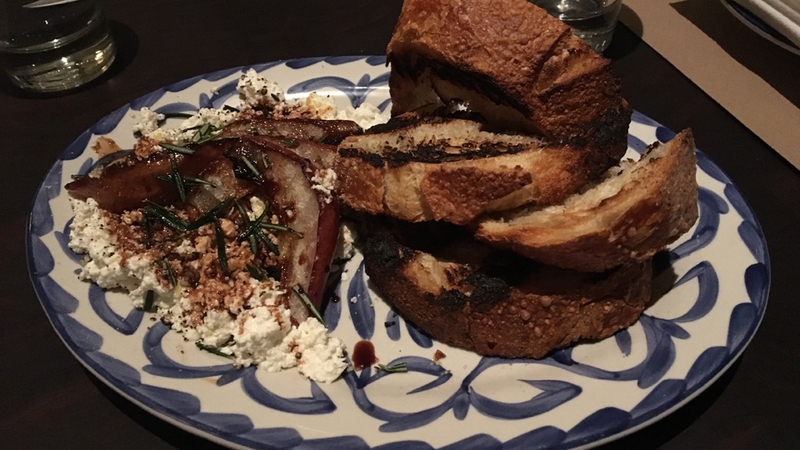 The ricotta appetizer, served with oven-roasted pears, aged balsamic vineyard and grilled sourdough, is a delicious fall dish, even on this unseasonably warm evening. I also very much enjoy the chicken meatballs, which are presented in a tomato sauce with black olives and ricotta. Our two thin-crust pizzas are terrific. 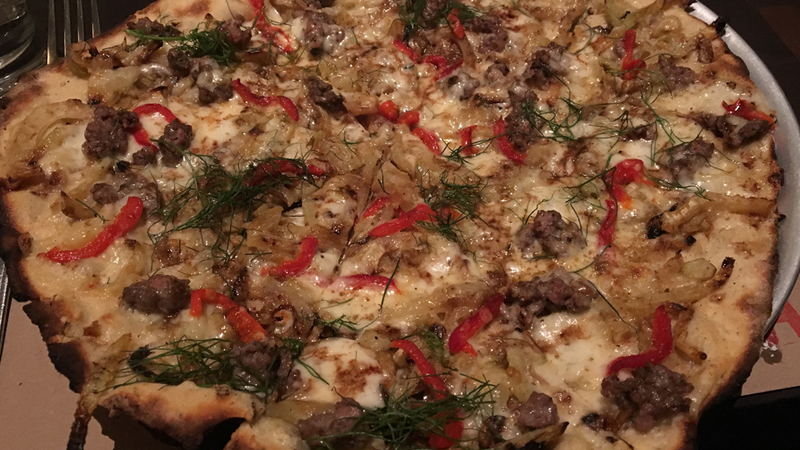 The Capra Pizza, one of Marta’s ‘white’ pizzas, if full of bold, rich flavors from the goat sausage, roasted fennel, Pecorino, Fontina and cherry peppers. 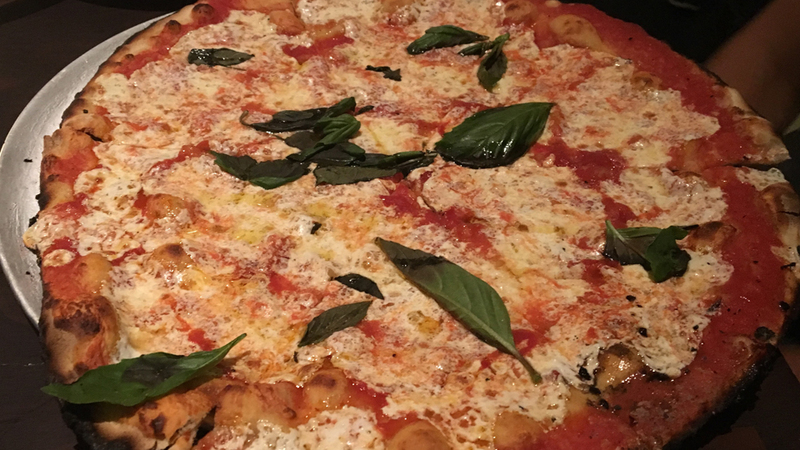 It’s hard to go wrong with the Margherita Pizza, which is also quite a bit lighter. Paul Bara’s 2005 Special Club is crisp, dry and refreshing, with a good deal of brightness that cuts through the decidedly intense, full-bodied flavors of the food. The 2012 Rosso di Montefalco from Adanti is a tasty, straightforward, trattoria red that is perfectly suited to Marta’s cuisine and overall ambiance. Marta is one of the restaurants in Danny Meyer’s Hospitality Included program in which prices include a service charge that is divided among all of the restaurant’s employees. This type of arrangement is designed to even out some of the income disparity that has traditionally existed between front of the house and back of the house workers in restaurants in the United States. Planned increases in the minimum wage over the next few years will put additional pressure on restaurants’ bottom line. Meyer has chosen to tackle this challenge proactively rather than wait until the situation becomes an even greater issue. Hospitality Included has not been without its challenges. Then again, Danny Meyer has been a pioneer for virtually all his career. Needless to say, it will be interesting to see where things go from here. 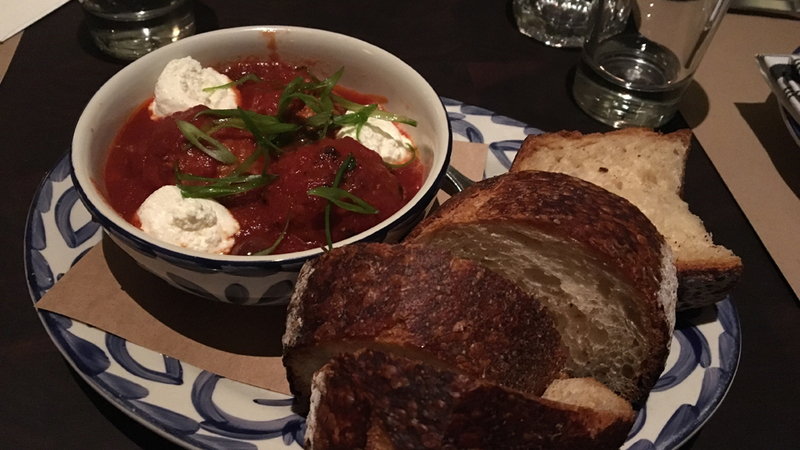 As for Marta, it is a fabulous place to enjoy a casual, informal meal with delicious food and wine to match.